Cape Coral’s tight rental market is getting a boost- a big boost. Coralina Cape Coral, a 186-unit luxury apartment community off Pine Island Road east of Veterans Parkway, is leasing and has set its official grand opening for next Thursday. The complex, which includes a clubhouse, fitness center, pool and parks, fulfills a housing market need in Cape Coral, which lacks multi-family options, officials said, adding Coralina is intended to complement the residential offerings of nearby Sandoval. The apartment complex site was originally part of the acreage purchased for the 524-acre Sandoval community, which also offers a range of amenities. “The undeveloped Coralina site was always zoned for commercial development and was part of the original Sandoval land assemblage. We retained this 10-acre commercial site when we decided to sell the remaining residential phase of Sandoval to Taylor Morrison Homes,” Dumas said. The need for upscale rental options in the Cape Coral housing sector was met with a unanimous vote approval by the Cape Coral City Council when the project was proposed to the city, he added. Affordable rentals for professionals such as teachers, police officers, firefighters and nurses as well as students returning from college and starting new jobs here are lacking in the Cape, he said. “They can’t afford a house yet, they haven’t established credit,” Williams said adding this is why this council, and the two before it, have been supportive of apartment projects. “Because there is a definite need,” he said. Apartment amenities include upscale kitchens with granite counters, an island and energy efficient appliances; laminate flooring in the living areas; and balconies and patios. Monthly rentals for one- bedroom units start at $1,195; two-bedroom units start at $1,409 and three-bedroom units start at $1,589. 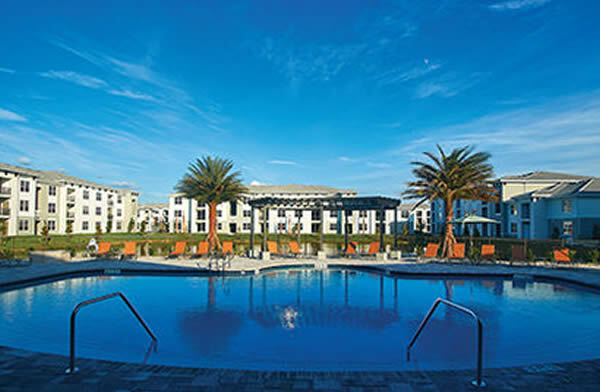 The Coralina Apartments will hold its grand opening from 5-8 p.m. on Thursday, April 12. A poolside event, featuring island style hor’dourves, a beer and wine cash bar, cocktails and steel drum music “for good vibes” is planned. A broad range of area residents, community and business leaders, and professionals associated with the project are expected to attend the new property launch, officials said. Members of the public interested in attending are welcome to RSVP to CoralinaRSVP@greystar.com to reserve entry. Reservations are requested no later than today, April 6. Coralina Apartment units are now available to lease. For information contact the office manager at (239) 540-7274. Office hours are from 9 a.m.-6 p.m. weekdays, 10 a.m.-5 p.m. on Saturday, and 1-5 p.m. on Sunday. More information may also be found at coralinacapecoral.com.